Home SharePoint SharePoint 2010 SharePoint 2013 SharePoint 2016 Tips and Tricks How to Enable Chart Web Part in SharePoint 2013? Disclaimer: I'm not sure this is a fully supported method, but it serves the purpose! Or you can download it directly from : Download Chart Web Part , BTW, I exported this from SharePoint 2010! 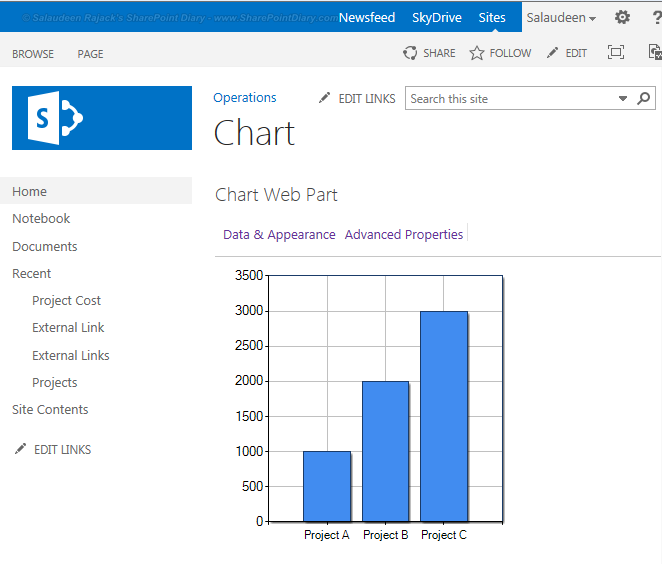 Next step is to enable chart web part in SharePoint 2013. Go to Site Settings >> Click on "Web Parts" link under "Web Designer Galleries" section. 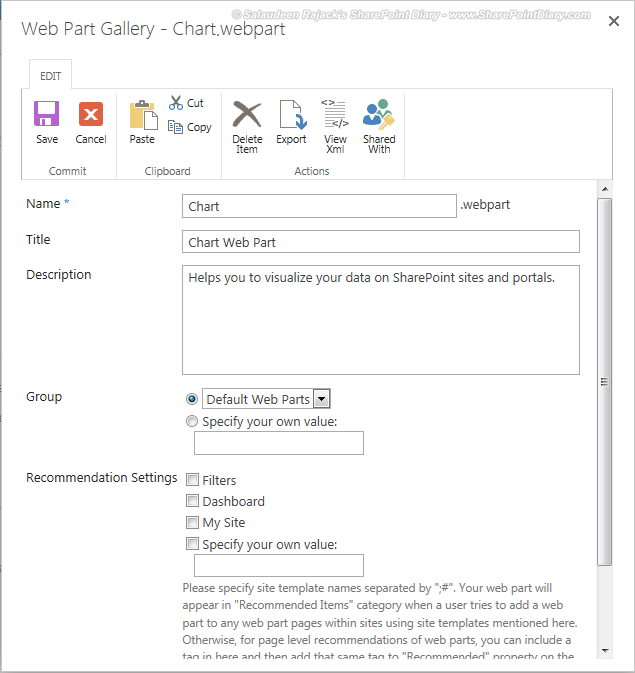 On the "Files" tab, Click on "Upload Document"
Locate the "Chart.webpart" file and specify web part attributes. So, now we have the web part ready! Navigate to any page where you want to add chart web part, Click on "Web Part" from "Insert" tab, Choose "Chart Web Part" and click "OK". 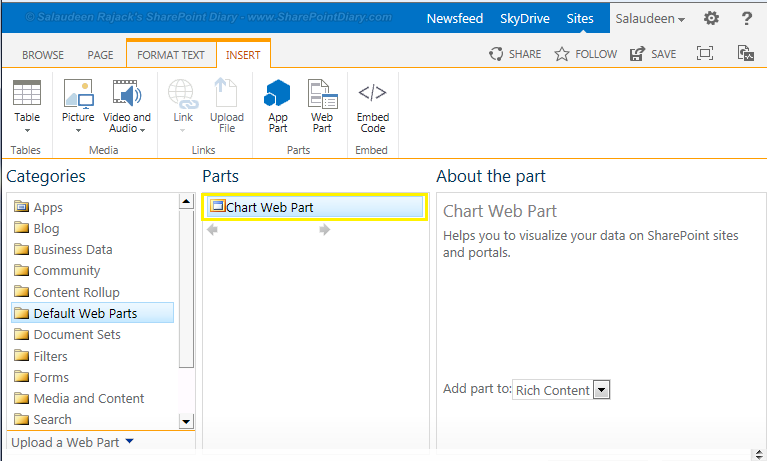 This chart web part also works in SharePoint 2016 and SharePoint Online too! Hi Salaudeen, this looks promising but when I copy and try and use I get a poorly formed xml error. Can you post the actual file for download? I also get an error about XML not correct. I pasted the code into Notepad and get all lines intersected with blank lines, but that couldn't cause the problem, could it? HI, i importet web part no problewm,buti got problem that anything that i click i get error something went wrong. This is awesome! Thanks Mr Salaudeen! Hi, When i tried in sharepoint online, I got error message like "The file you imported is not valid. Verify that the file is web part description file(*.webpart or *.dwp) and that contains proper xml file"
But i tried with .webpart and .dwp. still getting the same error. I'm getting the same poorly formed xml error mentioned above. I pasted the xml into a xml checker online, and it said it was valid. Anyone know what is going on here? After configuring chart webpart data connection nothing comes up. It always shows blank page. Any idea? Trying to use code but get the not well formed xml. Any ideas? Hey! Worked a treat for me - opened in xml editor, pasted data as above and saveas xml type and given the name "Chart.Webpart" - Upload to SP2013 and loaded onto a page and worked. Great! thanks. Guys to make this work you need to modify the 3 "xmlns" values. Shorten them to ONLY the URL, and delete all the HTML tags like "a" and "span" etc. They're on lines 2 and 56. I just copied the text into a .txt file and it worked first time. Did you save as a webpart file after copying into a .txt file? This is where I am stumped. I can't save it as a webpart file. Did you do anything special to save as a webpart file from the .txt file? Wooowww. Great help Bro!! serves the Purpose!! I have created a list with 3 columns, title , count (default value is 1) and status as "open" & "resolved". suppose i have 3 entries with two line item with status as resolved and one as open then the graph that i see is 3 columns on x axis as "resolved" resolved & open" and on y axis it show bar to 1 unit. Please help me find out how do i get the correct graph. Do you have any documentation to refer ? successfully connected my list, how do I filter for created & last 30 days? what would be appropriate default value?